TournaKit Pro is the only charity golf tournament software that combines the features of four specialized charity event planning software programs all-in-one easy to use desktop software application. We have integrated charity golf tournament software, special event software, auction software, and donor management software into a single and affordable charity event planning software program. 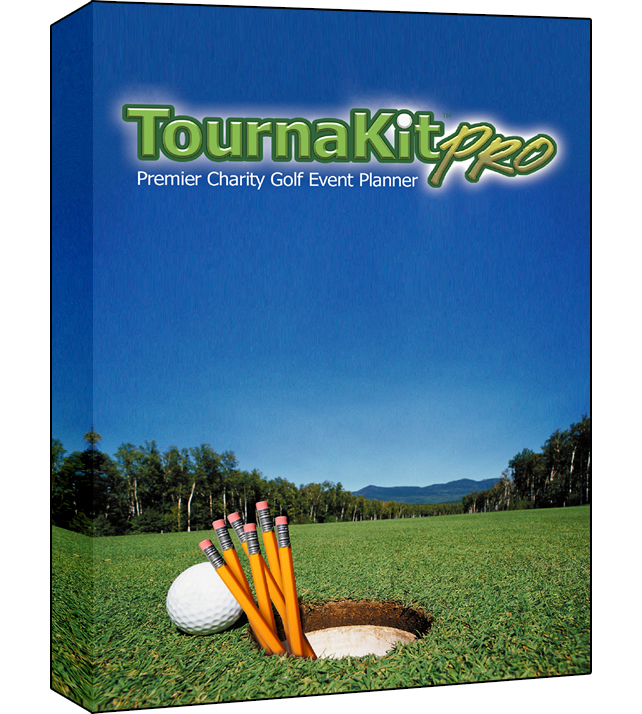 TournaKit Pro charity golf tournament software and event planner is for nonprofits, corporations. and individuals involved in fundraising through planning charity golf tournaments, galas, live or silent auctions, raffles, or special events. Novice or professional event planners, you will benefit with a time tested system for planning a charity golf tournament from start to finish. TournaKit Pro Charity Golf Software has been helping people with how to plan a charity golf tournament for over 20 years. Get the most out of your next charity golf tournament with Tournakit Pro charity golf tournament software! TournaKit Pro charity golf tournament software provides time saving features that will easily execute all of your charity golf event planning from one year to the next. TournaKit Pro is designed to handle more than just golf tournaments. Just one click changes the user interface from golf to special events. Plan your golf tournament, auction, gala, dinner party... all from one desktop application. TournaKit Pro is a complete event planning software solution. Originally designed for planning large scale charity golf tournaments, today TournaKit Pro is a broad based special event planning software tool. TournaKit Pro is comprehensive and flexible for all your event planning needs. Our customers say "clearly the most cost effective charity golf software and special event planning software available today." More than planning a charity golf tournament, TournaKit Pro charity golf tournament software will accommodate all types of special event planning. Are you an event planner working on a charity golf tournament, charity golf event, galas, dinner parties, board meetings, annual appeals, silent auction, raffles, membership dues, fund raisers...? You need TournaKit Pro charity golf software! TournaKit Pro provides in depth solutions for administrators that are planning an event, special event, charity golf tournament, charity golf event, silent auction, live auction, internal raffle, external raffle, and sponsor package management. Designed for charity event planning TournaKit Pro will automate and help improve financial, donor relationship, charity golf tournament, charity event and special event planning processes. Delivered through integrated data, adaptable solutions and automated systems, TournaKit Pro streamlines event planning, charity golf tournament planning, charity event planning, live and silent auction planning, and special event planning. TournaKit Pro charity golf tournament software will benefit small and mid-size organizations, and divisions of large enterprises to automate processes, make more profitable decisions, and accelerate growth. Depend on reliable features for everyday needs. Manage donor and membership groups, create and launch fund raising campaigns, handle mailings, track donor activity, organize pre and post special event planning and charity event planning activities. Increase security and protect your donors privacy. TournaKit Pro is a desktop event planning software application where the program files and data files are installed on your computer. Charity event planners take advantage of the most comprehensive and cost effective charity golf tournament software available today!